What are you hungry for? What are you craving? Food? Wine? Friendship? An end to this loneliness? The lighting up of the darkness? The excited buzz of fellowship? The warm embrace of love? To be hungry is to be human. To feed that hunger is to be human. And we live in a hungry, deeply hungry, age. We are all of us barraged daily with promises to feed our hunger, to quench our thirst, to satisfy our desires, to bring an end to the infinite craving, to fill the emptiness deep within. And so we are all consumers. We are not just people, but beings labelled as those who consume. We eat, and we eat, and we eat, as we try to sate the gnawing hunger that chews us up inside; and our eating is supported by an economic system that relies on consumption: of food, and wine, and travel, and all the accoutrements of modern life—new toys, new phones, new clothes, new shoes, new cars, new information, new everything. “I need a dress,” said my daughter. “But you have lots of dresses,” I said. “I only like the new ones,” she replied. In our society, even young children have learned to be consumers, ever on the lookout for more things and newer things than what they already own. Of course, the new becomes old. The dress fades; the book bores; the gadget becomes tedious; the toys no longer enchant. And so, being good citizens, we hurry off and buy the next dress, the next book, the next gadget, the next shiny new toys, and try to fill that gaping wound that yawns within. 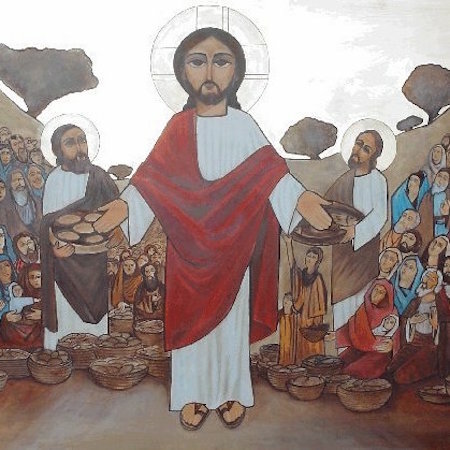 “Why do you spend your money for that which is not bread, and your labour for that which does not satisfy?” asks the prophet Isaiah. And well might he ask. Perhaps the answer is quite simple: that we have not yet learned that holding onto things will never satisfy. We seek satisfaction in material things, in owned things, in personal possessions, because we have not yet learned that everything is gift, and every gift is given only for us to give away. Instead, we clutch onto our gifts—our wealth, our comforts, our talents, our love—or else we ration them out; and we keep wondering why we are so ravenously hungry, so painfully empty inside. The ancient Israelites faced the same questions. These words from the prophet Isaiah are addressed to the Israelite elite who had been deported to Babylon. There, they had made lives for themselves. Even as they sang songs of lament for their beloved Zion, they raised sons and daughters. They worked in the local economy; they traded, bought and sold; and they capitulated to the demands of the empire. Inevitably, their identity became compromised. And so here the prophet is recalling them to their roots. For they are a covenantal people, whose faithfulness is expressed through neighbourly sharing, and whose economy should be based on the expectation of abundance. Nothing is harboured because God will always provide. They are a people who once relied on the daily provision of manna in the desert—food which could not be stored up; they are a people of whom jubilee was expected, if not always enacted. And here, the prophet is offering them a choice: come back to the way of shalom, of well-being, of neighbourly sharing. “You that have no money, come, buy and eat! Come, buy wine and milk without money and without price,” for this is the way of the God of your ancestors, the God who leads you out of captivity and into the ways of freedom and abundance. Come back, because your ways are leading you into avariciousness, anxiety, restlessness, hunger, emptiness, and despair. Come back to my ways, which are not your ways, says the Lord; come back to the ways of generosity and abundance and thanksgiving and well-being. Come back to shalom. This is an alternative economy, and an alternative that speaks to us here and now. For we are all caught up in Babylon: in an economy and a system which drives us to get the most toys, to keep up with Joneses, and to fear any threat to our perceived wealth. And so as individuals and households, we pour our time and energy into consumption, and into that which does not satisfy; and as a nation, we patrol our maritime borders and pour billions into offshore detention centres so that we do not need to share. We participate in an economy of fear and scarcity, when all the evidence points to a different reality, God’s reality: that there is more than enough for all. And so we become the walking wounded, the ravenously hungry, the flesh-eating undead. And yet, we have hope. Our hope is in God’s ongoing action in the world; God’s ongoing call to change, God’s eternal expression of forgiveness, and love, and healing. In chapter 56 of Isaiah, God speaks through the prophet and tells the people to “Maintain justice and do what is right, for soon my healing will come, and my freedom will be revealed.” God’s ways, of justice, righteousness, generosity, forgiveness of debts, and hospitality—these economic practices, these ways of living, will heal us. Every week, we gather here to practice God’s economy—to eat together, to love one another, and to be recalled to justice, and hospitality, and generosity. We may not be ancient Israelites exiled in Babylon, but we are modern Christians living in a rapacious economic system, and our faith is rooted in God’s abundance, God’s shalom. And so every week, we hold up the body of Christ, and give thanks. We give thanks to remind ourselves that it is never ours—it is always a gift from God. We break it and we share it, because every gift from God is a gift from abundance; a gift to be shared; a gift given for the life of the world. In the same way, as members of the body of Christ, we learn that our own lives are gift: a gift from abundance, a gift to be shared, a gift given for the life of the world. We give our lives away because we are confident that the eternal source of life, the God who promises healing and freedom, will always replenish us.